Karethic are a beautiful, ethical brand founded and manufactured in France. 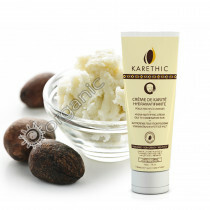 Family owned and founded by two sisters, Carole & Glwadyss Tawema, Karethic is a cruelty-free shea based skincare brand with certifications from Ecocert, Organique Cosmetique, Fair trade and their Shea is also certified and guaranteed unrefined. Founded in 2005, Karethic’s mission has been to promote the healing & nourishing properties of unrefined shea butter as well as highlighting the cultural heritage of shea that has been handed down from generation to generation by thousands of female producers in Africa. The Shea tree is very much a part of African heritage and spirituality. Karethic’s handmade Shea is produced in Benin, Africa by African women as part of 12 co-ops who are partners of the company Karethic Benin and it’s ‘little sister’ Terrethic France. Such a unique brand, with a huge heart, Karethic guarantees it’s customers and clients the best of what Shea has to offer, including the unmatched know-how of the female producers, from the raw material to the final product: a fresh butter, naturally purified and full of repairing properties. Ethical, certified, sustainable and partnering with the women who produce the ingredient at the source, Karethic’s story is one of a kind. To find out more please go to the ‘about us’ section of our website, there is so much information that you won’t want to miss.